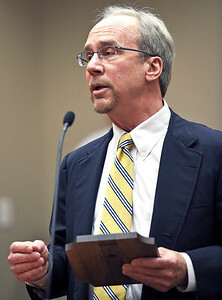 Kayla Wolf for Shaw Media- Joe Canevello speaks after receiving the Liberty Bell Award on Friday, May 5, 2017, during Law Day hosted by the McHenry County Bar Association at the McHenry County Courthouse in Woodstock. The Liberty Bell Award is given to a non-lawyer that promotes a greater respect of the law. Kayla Wolf for Shaw Media- Hannah Beardsley Middle School eighth grader Lucas Kim received one of three essay contest awards for writing about the fourteenth amendment. The McHenry County Bar Association has hosted Law Day since 1957. 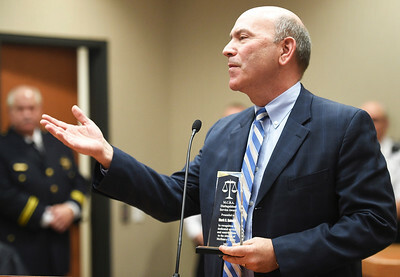 Kayla Wolf for Shaw Media- Attorney Mark Saladin thanks family and colleagues Friday, May 5, 2017, for the Distinguished Service Award he received as part of Law Day at the McHenry County Courthouse. Saladin serves on the Woodstock City council and volunteers in many aspects of the community. 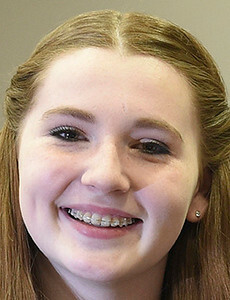 Kayla Wolf for Shaw Media- Heineman Middle School seventh grader Dylan Lyon received one of three essay contest awards for writing about the fourteenth amendment. 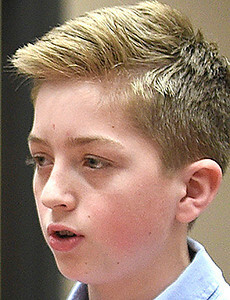 The essay contest was hosted by the McHenry County Bar Association and the awards were presented as part of the Law Day ceremony at McHenry County Courthouse in Woodstock. Kayla Wolf for Shaw Media- Hannah Beardsley Middle School eighth grader Jordyn St. John received one of three essay contest awards for writing about the fourteenth amendment. The McHenry County Bar Association reported receiving 75 essay submissions for the contest. 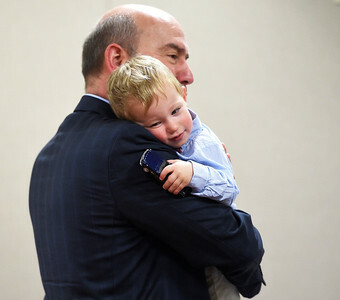 Kayla Wolf for Shaw Media- Attorney Mark Saladin holds grandson Jack Saladin prior to an award ceremony for Law Day 2017 Friday, May 5, hosted by the McHenry County Bar Association. Saladin was awarded the Distinguished Service Award for his work in the community over the years.